Hey there! For all you bookworms out there among the Kingdom Hearts community, we’ve got some exciting news for you! Yen Press, the current publisher of the Kingdom Hearts Manga, has announced the localization of the first Kingdom Hearts novelization. This has been a long time coming as the original novelizations were released nearly 10 years ago. Since Yen Press acquired the rights to translate the manga after it was dropped, sadly unfinished, by Tokyopop, fans have eagerly awaited their stance on translating the novels. Their response was to wait and see the fan response to the manga, though not ruling out the novels completely. Since then, the closest we’ve seen to reading Tomoco Kanemaki’s detailed and character-deepening novelizations have been excerpts by fan translators. Well, we finally have confirmation that they will officially be in our hands. Recently, Yen Press added KINGDOM HEARTS: THE NOVEL to their list of upcoming releases on their website. 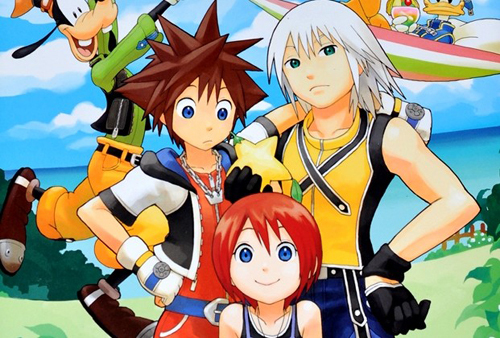 On the Destiny Islands, three children–Sora, Riku, and Kairi–are living out their peaceful, carefree lives while yearning for whatever lies beyond the great ocean. But one night, an unexpected disaster takes place, and the three are torn from each other and their island home. Meanwhile, at Disney Castle, Donald Duck and the other castle residents are in an uproar upon discovering King Mickey has suddenly gone missing. When fate brings them together, Sora, Donald, and Goofy set out on a grand Disney adventure to find their friends!